For many families, home-educating overseas is a daunting prospect. There’s a whole list of things to consider when making the decision to home-educate your child, no matter where you live. Throw in a whole new country and the list only gets longer! But fear not. The decision to home educate abroad can be a tough one, but it doesn’t need to be overwhelming. This blog will answer the main concerns for parents like you considering home-educating overseas; from pros and cons to enriching your child’s social life without physical school. With first-hand tips and experiences from expat home-educators, we’ll answer your most pressing questions to help ease your mind. What are the pros and cons of home-educating overseas? There’s nothing like a good ‘pros and cons’ list to weigh up your options. Below are a few of the key benefits of pursuing home-ed abroad, as well as some of the potential drawbacks. A consistent education – children can easily pick up where they left off when moving from country to country, minimising any disruptions to their learning. Personalised learning – home-ed kids can learn at their own pace, without the distractions of a busy classroom environment. This is particularly helpful for children with learning and mental health difficulties, which mainstream schools may not be able to cater for. An easier transition – expat families choosing to home educate avoid the stresses of finding a school overseas, including curriculum clashes, language barriers or costly international school fees. Flexibility – learning from home means no more school runs, freeing up more time for your child to pursue their interests and explore all of the opportunities being an expat kid has to offer. The legality question – depending on where you live, home-ed may not be legal and your child may be obliged by law to attend mainstream school. Lack of structure – if you choose to home-educate your child by yourself, it can be hard to know where to start. Home-ed resources may be few and far between if it is still an unfamiliar concept in the country you live in. No in-built social circle – making friends takes a little more effort for kids who aren’t attending a physical school. Moving to an unfamiliar country adds an extra element to this process. Is home education legal abroad? Home-education laws vary from country to country, so it can be luck of the draw where you end up living. In Germany, for instance, home education is not allowed, however in countries such as the USA, France, Canada and Australia it is totally legal. Some places have different laws whether you’re an expat or a local. For example, local Cypriots aren’t allowed to home-educate. For some expats living in Cyprus, on the other hand, home-ed is both legal and a popular option. In any case, it’s well worth doing a bit of research. You can find an index detailing home-education laws in over 90 countries here. How can my child make friends in a new country without school? You may be worried that your child might lose out on a fulfilled social life if you choose to home-educate in your new country. After all, mainstream schools provide so much more than just education. They come with a built-in social network that can help make the relocation process much easier for your kids. “My family and I home-educated prior to moving to Dubai, which made things a little easier. I planned the curriculum before I left and brought it with me as I didn’t know what to expect. Things changed and we did a lot more trips for education and learning from our new environment. I did a little research on Facebook to find out about any home education groups in Dubai, and luckily I was successful. The home-ed group here is amazing. They run all sorts of field trips and park meet ups, where we’ve met so many lovely families. Our home-ed journey has changed so much since moving. What support is there available for expat home-ed parents? No matter if you live at home or abroad, home-educating your child is no easy feat. Gathering resources, planning a curriculum and teaching your kids is often a full-time job in itself. Luckily, as home-ed is becoming more popular internationally, more support is available for expat home-ed parents both online and locally in the community. If you’re looking for a more structured approach to your child’s education, online schooling is a brilliant option. It provides a full-time, English curriculum-led education that your kids can access from home or anywhere with a stable internet connection. Your children are taught in live online lessons by fully qualified teachers, taking the pressure off of you to do it all yourself! “My son (12) has been diagnosed with Aspergers syndrome. It’s not only hard for him to constantly adjust to new schools, but it’s almost impossible for him to stay focused in noisy, busy school environments. He has attended mainstream schools all of his life, but then we hit a wall when we moved to Bahrain. Children need to feel safe before they can begin learning. With online schooling, my son feels safe because he is at home with mum, but he can also see the teachers, talk to them and to his classmates just like in a “normal” school. Want to know more? 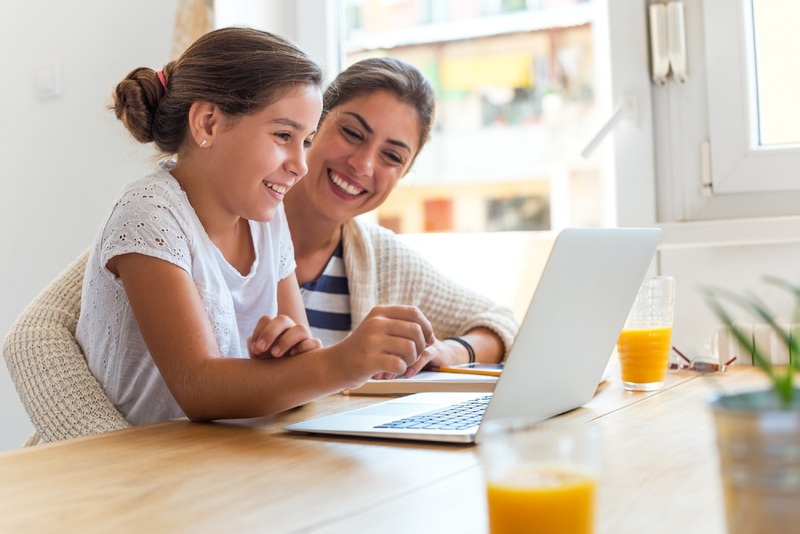 Click here for some of the benefits of online schooling for your expat child.